Take any Base money supply amount. With FRBanking any increase in the money supply, and therefrom all money in circulation, is lent into existence, securing a loan amount (A) with a contract and [Promissory Note]. Between the loan contract and [Promissory Note] is an obligation to repay the interest on that loan along with the principal (A + B). If ALL money in a debt-money system comes into existence as a debt, and if all loans require the repayment of a sum greater then the principal amount, then from where does the interest payment money come into existence? This is partly covered in the Zeitgeist Addendum video, Part 1 [Note from PM: actually, the reader is referring to Part 2 of that video, at this point in the video]. Steven Lachance identifies the unpayable interest as the achilles heel of the debt money system, if you check it out here. Your thoughts, please, if you are still posting on this subject? 1. All money is debt issued by banks (whether currency issued by a central bank, or credit issued by a chartered private bank). 2. Banks charge interest on every dollar of debt they issue. 3. Therefore, if the money supply (M) is equal only to the principal that must be repaid (P), such that M=P, then – at all times – there is not enough money in existence to repay all of the interest (I) in addition to all of the principal. In other words, at any point in time, M < P+I . 4. Therefore, if P+I is to be repaid, additional money, equal to the amount of interest owing, has to be created by the banks. In other words, M has to be increased by at least as much as I. 5. However, because all money is debt, when you increase the money supply (M), you also increase the principal that must be repaid (P). 6. And, because banks charge interest on all principal, interest is also owing on the additional principal. 7. Therefore, the use of debt as money results in a situation in which the principal can never be repaid. Upon this mix of fact and falsehood, any number of conspiracy theories has been founded for decades. What they have in common is the idea that: there has been a conspiracy, by bankers, to empower themselves – financially and politically – by making us all dependent upon a money system that turns us into indentured servants. Christians blaming “Mammon” (a devil) and warning that the world is doomed if we do not start praying the Rosary on a daily basis. “New World Order” conspiracy theorists, some of whom target one or more of the following: the Trilateral Commission, The Council on Foreign Relations, the Bilderbergers, Jews, Freemasons, “the Rothschilds”, “the Rockefellers”, Capitalists, Communists, (and on and on), or any mixture of any of the above. Other people who want something for nothing and believe, after reading about Clifford Hugh Douglas‘ “Social Credit” monetary system, that everyone could have something for nothing if we just adopted the Social Credit system (or one of its variants). See, as an example, the history of William “Bible Bill” Aberhart and the “Social Credit” party of Alberta (interesting note: the first student of Bible Bill’s bible school was Ernest Manning, who later became the Premier of Alberta. His son, Preston Manning, formed the Reform Party of Canada, which eventually morphed into the current, governing, Conservative Party of Canada). 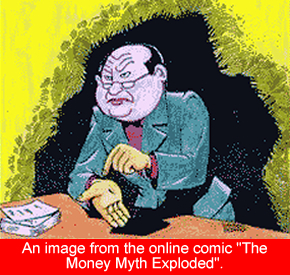 A classic example of the use of the Interest Myth to found a conspiracy theory is a little comic book titled “The Money Myth Exploded” the story for which was written by Louis Even, one of the founders of the Pilgrims of St. Michael. The story is simple. A bunch of productive people are stranded on an island with no medium of exchange. A banker among them suggests that they borrow his paper money and repay it with interest. A while later, they figure out that the banker has tricked them by getting them involved in a collectively un-repayable debt. The comic book lays out the myth, roughly as described in 1-7, above. I refer to “The Money Myth Exploded” not because I think it is a worthy read, but because the story actually demonstrates why the Interest Myth is a myth. There are two main problems with the Interest Myth, and each is illustrated by the facts of the story. First, in the story, the banker does not participate in the economy except to lend money and to expect its repayment with interest; he is not trading. He buys nothing and consumes nothing. The key line is this: “And it’s money you’re asking for, not our products.” The banker might just as well be visiting from Saturn when he drops of the money, disappearing, and visiting again when he comes to collect it all plus interest. But, of course, that’s not how things work in the real world. Bankers are human beings, just like everyone else: they need food, shelter, clothing etc.. They don’t just lend out money: they trade the interest they receive for the goods and services offered by the very people to whom they lend money, and those people use their profits to pay others for goods and services (which others, similarly, profit), to pay interest to the banker, and to pay down principal they owe to the banker, over time. Bankers lend money to grocers, and clothing retailers…but they also buy groceries and clothing with the interest that they earn on the dollars they loan out. They use some of the interest to pay employees – – receptionists, secretaries, tellers, cleaners, security, etc. – who buy groceries and clothes. They pay some of the interest to power companies to light and cool the bank; to natural gas companies to heat the bank…and those power and gas companies pay employees…who buy groceries, and clothing, and gas, and electricity, etc. Yet, in the story, the banker somehow – without producing anything all year long, and without obtaining anything other than a shelter from his borrowers – eats, stays warm, gets from one place to another etc. Second, in the story, the banker is expected to demand the simultaneous repayment of the entire money supply at some point. That is never the case in a real economy. People generally pay in installments of interest and principle but, more importantly, they do not repay all of their loans simultaneously. As some people pay-down principal, others take on debt. Old debt (i.e., money) is cancelled by way of repayment, as new debt (i.e., money) is issued by the banks to other borrowers. Note that, if all of the money were repaid: there would be no more money, because debt ceases to exist when it is repaid. Nobody, not even the banker, would have money if the banker called in all of his loans. Therefore, there would be no medium of exchange with which to satisfy/pay outstanding debts (such as interest, rent, etc.). The entire story is silly. However, that which is wrong about the story is essentially that which is wrong about the Interest Myth itself. The Interest Myth rests on the implicit assumption that banks are not trading in the economy; that they exist and survive independently of the economy. Now, all of that said, I know for a fact that the essential Interest Myth argument – that “there can never be enough money to repay the principal plus the interest when the money supply is debt” – can be a compelling one when it is first encountered. The argument is so easy to understand, yet so offensive, that ‘discovering’ it leaves one ready to believe that those who set up the debt-based money system did it precisely because “the principal plus the interest debt can never be repaid”, and because they wanted to enslave a nation. For that reason, I thought it might be helpful to my readers – including the reader who asked the question at the beginning of this post – to “explode” the Interest Myth, as follows. Paul, if you wish please repost your example which you say proves that X can pay X+i. Step 1: W = $0; M = $0; B = $0. Because there is no money, there is no price system. No snow is expected for 10 weeks, so W (who shovels snow and cuts grass for a living) has nothing to exchange for M’s housekeeping services (one service per week) or B’s bread (one loaf per week). Let’s see if W can repay $20 principal plus $2 interest in a system where all of the money supply – $20 – is issued by B to W as debt. Let’s make the following reasonable assumption: B doesn’t ask for all of the money to be paid at the end of one year. Instead, he asks to be paid in installments. Usually, they are monthly, but for ease of computation we’ll assume that B wants weekly installments of $22/52. Let’s again add-in person M.
Step 3: For 10 weeks after borrowing money from B, W does no work but buys bread ($0.50 per week) and maid services ($0.50 per week) for 10 weeks. Over the next 42 weeks, the banker will receive $42 for his bread. He will also receive $17.77 from W as repayment of principle plus interest. W has $5.77 on hand. So both parties have to raise their prices enough that W can pay the remaining $12.00: each party has to raise his/her price by about $0.30. So, W and M will now charge $0.80 each per week for their respective services. If my math is correct (and I’m quite willing to accept demonstrated proof that it is not), W has repaid both the $20 principle and the $2 interest on the $20 debt, and no extra money had to be created. Now, you may argue that, because B is putting repayments of principal back into circulation without loaning them to anyone, the supply of debt money in my example is being converted into non-debt money, and that is correct. But it is entirely irrelevant. Were the repayments of principal simply re-loaned out to other persons by B, what was true for W (possibly at a later date) would be true for everyone else who rented notes from B: all, over time (and at differing times) would eventually be able to repay both their principal plus interest without B increasing the money supply. Let the inevitable refrain of “but what you fail to realize, Mr. McKeever” begin…as it always has with this topic. Despite our obvious agreement on full reserve banking, I may have inadvertently raised a point that doesn’t belong here. I didn’t mean to raise any conspiracy theories; rather I prefer to focus on the apolitical aspect of monetary reform. I am familiar with the Social Credit philosophy of Major Douglas. And, because his approach is one of science and mechanics, I thought it would be a simple point of reference for your opinion on the problem of A + B .
I will be glad to forward your commentary for the SoCred reply. Let me begin by saying that if facts 1-3 are TRUE, then your fiction-labeled 4 -7 are also true. That is to say, they are not fiction. And they cannot be made fiction by declaration that a certain, common, conspiratorial myth has been exploded. No explosions here that I can see. Everything said in 1 – 7 is about the monetary system, that is, it all has almost nothing to do with either economics or the economic system, per se. It all stands on its own as monetary policy matter. Capital markets and price-profit mechanisms have NO effect on the mechanics of the money system. Your 5-point exercise simply ignores the matter of the failure of debt-money to operate on a sound, scientific and mechanical manner, as well as mathematical. The interest payments due on all the debt money out there ARE GREATER THAN the increase in the nominal amount of debt-money GROWTH in any specific period – like now. To wit – We aren’t creating enough new debt-money fast enough any more. In case you haven’t noticed, the TRILLLIONS of new money created by the Fed have gone to add new PRINCIPAL and new RESERVES to the Money System. Paul Volcker has characterized our “credit-crisis – debt-crisis” as the inability to make our debt-service payments. Scientists and economists here are leaning toward the debt-money system being broke, as in insolvent, a condition consistent with both your money-myth parable and my original question. This problem is not something that can be finally crushed by the fact that in your chosen parable the banker didn’t buy groceries, and wanted the money repaid as was agreed beforehand. I don’t know how to characterize your criticism of the interest problem of debt-money, which I see as THE problem, but I don’t agree that you have exploded any myths out there, except the one that you created. The more I read it over, Paul, the less convinced I am. You imply the creation of new money by virtue of either a billing or accounting or contractual matter. The fact that exactly only $20 has been created means that ultimately there is only $20 available to make the payments that are contractually due, at any price. Either we do not agree on the definition of money-creation, or we have given brand new meaning to creating money out of thin air. joebhed: Just read through my example, which demonstrates the falsity of the idea that $X cannot be used to satisfy debt of $X+interest. The creditor doesn’t just receive money: he also pays it back into the economy. So the same $X can be paid to the creditor any number of times. A has a $20 note. A satisfies his half of his debt to B by giving B a $20 note. B turns around and satisfies half of his debt to C by giving C the same $20 note. C turns around and satisfies half of his debt to A by giving A the same $20 note. A satisfies the remaining half of his debt to B by giving B the same $20 note. B satisfies the remaining half of his debt to C by giving C the same $20 note. C satisfies the remaining half of his debt to A by giving A the same $20 note. A single $20 note has been used to satisfy $120 owing. But if you remove time from the scenario, you are left asking yourself: “If I’ve got $20 but $120 are owing, where is the other $100 going to come from?” and concluding, erroneously “Clearly, someone has to print up another $100”. Thanks so much, Paul for having this discussion. As a non-economist trying in the past year or so to increase my economic literacy, I stumbled upon this subject of money creation as debt, and the conundrum of “We only create the principle, not the interest.” I still need help from metaphors to understand these really abstract concepts, which is why the parable of the men on the island appeals to me. For the record, I am not a Social Credit guy and eschew any racist or religionist baggage that other people exploring and discussing money creation may bring along, and I didn’t see any of it in Joebhed’s comment. Though I am new to your site, I don’t see evidence of it here, either, thankfully. Isn’t money creation (in a modern society, with a central bank) is a separate thing from economic activity within that society? Even if the banker in the parable cited above takes money made from interest earned from the islanders and uses it to buy their goods and services, it doesn’t create any more money. Allow me a new metaphor. I need some water in the bathtub. The only way I have of getting water (money creation) is to borrow it from the Federal Water Reserve. But the Reserve charges 1% per year interest; for every 100 gallons I buy, I need to pay back 101 gallons at the end of the year. It can slosh around in there many times, but the sloshing around in the tub (economic activity) doesn’t create any more water, just as the banker, buy purchasing from the islanders, doesn’t create any more money. To continue the metaphor, it seems to me that the only way to keep water in the tub for any significant period of time, is to somehow borrow (that’s your only way to get more water) more this year than you did last year, in essence paying back the interest owed on previous loans with some of the new principle that you’re borrowing now. Right? That’s the only way a debt based money creation system can be sustained, more and more debt, and the problem of the money to pay back the interest is the part that, to me, makes the unsustainability of debt money creation obvious. My US Constitution gave the citizens their own spring (the right to coin money) and the US Congress gave it away to the Fed. Now we buy back the water from the Fed with notes that promise to pay it back with mere water than we borrowed originally. All we need is some water in the tub so we can get on with the economic activities that really contribute something to our lives. That’s why I support the idea of US Treasury issue, debt free money creation. First, a point of clarification: I do not contend that joebhed is a conspiracy theorist of any sort. My reference to those conspiracy theories was a cue to anyone who – like yourself – is just becoming aware of the claim that $X cannot be used to pay $X+interest. Those conspiracy theories have a way of clouding minds: worried that there might be a conspiracy afoot, some people see it as a risk to doubt the claim that $X cannot be used to pay $X+interest. That fear of risk – that resistance to believe that the claim is false – can make it very difficult for a person to accept the clearest of evidence that $X can and is used to pay $X+interest. Now, as to your bathtub example: it doesn’t work because water is not a medium of exchange. You don’t take a bath in bath water and then expect someone else to trade some services for your dirty bathwater. Your example is no different than imagining that you borrowed a cake, ate it, and then had neither the cake nor an extra slice (i.e., interest) to repay. You can’t repay your cake and eat it too. Hence one reason gold, but not cake, was a successful medium of exchange. If you want to understand that $X can and is used to pay $X+interest, stick with examples that involve dollars, rather than bathwater or cake. Metaphors can confuse the issue. To pay the interest, you have to take the capital you’ve borrowed, and use it to earn capital+interest. Productive effort usually results in money changing hands, and the circulation and recirculation of money – among all in society, including bankers – allows any number of dollars of principle+interest to be repaid by any amount of money. I think that being a reader on monetary policy, it can be assumed an understanding of the V factor in that policy. That is to say, the (velocity) rate at which money is circulated within an economy is a part of the equation that leads to the determination of the Q or the amount of the money needed in circulation. However, it should also be obvious that this factor does not obviate the need for an influx of money to provide repayments of the interest on our debts. Again, look at Volcker’s comment and tell me if you agree with that assertion or not. Is the salient sympton of the economy of the United States today that we do not have the money to make our debt-service payments? If you re-read How Debt Money Goes Broke, it can be seen that Lachance finds it possible to partially obviate, or he reduces, the need for debt-interest money, via the fact that commercial applications can produce newer means of extinguishing debts. Frankly, I don’t even agree with that. More importantly, he identifies three-quarters of the debt at that time, and obviously growing today, as debt for which thre is no conurrent off-setting potential. I promise to re-read your example again. I have long been looking for the explanation that proves wrong that theory laid out in the Zeitgeist Addendum, Part ONE, which was the money-system. Part Two was the Economic Hitman. Part Three was the Utopian Resource-based Economy. In reviewing all of the criticisms I could find of the Addendum, I find the Creature From Jekyll Island author’s the most strident, yet totally lacking in substance. So, is there another out there? I don’t want to hog this discussion, so I hope some regular readers will comment here as well. Thanks for your response which I am digesting. I’ll let go of the bathtub metaphor; I guess it didn’t work as I didn’t mean the water would be eaten like cake or used up on any way. I only meant it as a metaphor for the money supply. I understand how an individual can pay back principle plus interest, but where did the money for the interest come from originally? Some place other than the principle on somebody’s debt? What is you opinion of the assertion that if all debts were paid off, there would be no money? I appreciate the time you take to answer these questions. I promised to re-read your solution viz the money supply and the debt-money-interest riddle. ALL money is created as debt. We agree on that, no? That was one of your facts. The one I call the CREATION factor. Paul, excuse me for asking but, are these “creditors” banks? You haven’t stated that they are banks, but you implicate by this discussion about debt-money creation and the interest factor, that A, B and C are banks. Otherwise, these debts are not part of the debt-money-supply according to your definition in 1. By that definition, B could only owe C $40 (of debt-money that has been created) if that $40 increased both the total of debt-money in existence and the total of the debts owed. Again, otherwise by definition, we are not discussing the problem I first raised of money creation via debt. You’re back to velocity. Carrying that thought forward, the money supply in your example is automatically, and by that I mean by your definition, a minimum of $120, and more likely $140. Again, either that, or we need to re-define the money supply. ALL money in the money supply is CREATED as a debt – everything from a chincy Fed faux-money issuance of One-Hundred-Billion$US to Treasury in return for a USG note, right down to the local bank’s providing me $1,000 in return for a PN(repayable with interest) and the pink slip to my ’56 Chevy. When the bank CREATES through fractional reserve banking and lends me the $1K, that IS money-creation. When I give it to Johnny for the Chevy, and then Johnny lends that money to Fred, and Fred buys tomatoes, etc., etc., none of these other transactions result in an increase in the money supply. As such, they are not relevant to the repayment of my $1K to the bank with interest. When Fred sells the tomatoes and pays off the loan to Johnny, guess what? I still owe the bank $1000 plus interest. So all those other transactions, while wiping out $3K in turnover of the $1K of debt money, have done NOTHING to eliminate the debt-money enigma. I still owe A+B, and the WHOLE MONEY SYSTEM has only created A. The debt-money problem relates to the fact that ALL money is CREATED as a debt, that must be repaid with interest. Again, it is not a problem that relates to the number of times the $1K changes hands WITHIN the economy, and, as such, it is not a problem that can be solved via those internal turnovers of the money, regardless of their volume, or their velocity. Sorry, Paul, but it should become painfully obvious at some point that using your example and your rationale, you could take that $20 and run as quickly around the country for as long as you could and pay off all the nation’s debts. If a $20 bill can repay $120 in debts, then why not $120,000? All you need is enough time. Paul, I do not represent any other claims that may have been made about the problem that A+B IS ALWAYS > A.
I asked for your opinion, and we are discussing that opinion and my opinion. With your permission, and despite your earlier good works on this subject that may place you in the position of determining what constitutes myth and what constitutes reality, I would like to escalate THIS discussion to THE discussion on the achilles heel of the debt-money system. Either it is, or it isn’t. I am open to your ability to proving your theory is correct, and I invite you to draw on your long history to play the trump card here. Right here, on this your blog. Once and for all, you CAN settle it. PS – for some reason, in your entire explosion of the interest myth, and in your presentation of various examples of multiples of debt repayments, you NEVER mention the interest, only the debt. No place other. The money that is borrowed is used to pay back the money and the interest on the money. What makes that possible is the fact that the bank pays interest back into the economy when it pays its employees and suppliers. If all debts were paid off, there would be no fiduciary money, that’s right. However, that would not prevent people from using things other than debt as money: e.g. gold coins. Yes, we agree on that. These days, some of the debt money is called “currency” (i.e., debts issued by central banks) and some of the debt money is called “credit” (i.e., debts issued by chartered banks). The example you are referring to was to demonstrate that any amount of money can cancel a larger amount of debt. It doesn’t matter why the debt arose; whether it is principle owing, or rent owing or interest owing (note: both rent and interest are money paid for the temporary use of capital). The example I intended you to re-read was the one in my original post, above, which explicitly involves a bank (B). No. Not all debts are money. A can lend a $20 note to B, who can lend it to C, who can lend it to D who can lend it back to B, such that B owes $40: $20 to A, and $20 to D. In such a case, apart from the $20 of debt that is money, there is $80 of debt that is not money. You are correct that “none of these other transactions result in an increase in the money supply”. However, you miss the point. If Fred is the bank to which you owe interest, and you are the guy growing and selling him tomatoes, then (a) the the bank is paying some of its interest revenues to you, and (b) you are then able to pay those tomato revenues back to the bank (Fred) in satisfaction or partial satisfaction of the interest you owe. You are referring to situation that is entirely unreal: a demand that all dollars be repaid simultaneously; this is unreal because it implies the elimination of the money supply altogether. That is one of the two errors I pointed out in my original post. So long as the banks are not demanding the return of all debt – so long as they are not eliminating the money supply – there is (a) no problem paying interest, and (b) paying interest does not require an increase in the money supply. Correct: all debts that are not money could, in theory, be repaid with a single penny. A claim that such is impossible would be wholly and demonstrably false. The example in my original post is a proof that $X can be used to pay $X+interest. I do not argue that which is implied by all of those who say that $X cannot be used to pay $X+interest: each implies a scenario in which the repayment of all outstanding debt money is demanded, and no new debt is issued; each implies an elimination of the money supply; each says merely “if we remove all money, how can we pay debts of interest that are owing?” Clearly, the answer is: you cannot pay for anything without a means of payment. You cannot pay rent, you cannot pay for groceries, and you cannot pay interest. But there’s nothing fascinating about that: a two year old knows he cannot buy bubble gum if his father takes away his quarters. Paul, I am re-re-reading things again. I started this discussion by commenting on and raising a question relating to fractional versus full-reserve banking. My question had to do with fractional-reserve MONEY-CREATION by the Fed, or by private commercial banks that have that monopoly cartel privilege. My question addressed the matter that in the present fractional-reserve, debt-money system, an ‘achilles heel’ exists with regard to money supply expansion via debt-money, and again, thus, the TOTAL money supply, due to the failure to provide for the payment of interest. Why don’t any of your replies address this question directly, rather than transferring the monetary system discussion to the banking system discussion? Trying to read between the lines of the many conspiratorial myth charges of your response, I don’t see a thing that addresses my point, or my question. I am left here with an unexpected conclusion that you are incapable of addressing he money-system question. At some point, you WILL need to recognize the difference between the monetary system, of which the money supply and monetary polcies are parts, and the capital markets and the banking system, WHICH HAVE NOTHING TO DO WITH THE MONEY SYSTEM. In fact, if you read M. Friedman’s Framework for Economic Stability, it can be seen that this discussion IS, and ought to be, about the separation of the banking powers from the money-creation powers. The joining of these two functions is what constitutes the fractional-reserve banking system of the Fed, which is what I thought we both opposed. Of course, again, in Friedman’s Framework piece he fully supports full-reserve banking, our common denominator. I find your rush to join these discussions, to hopscotch back and forth between money-creation and banking, is counter-productive to an infomed readership here. I leave your idea that somehow $20 can repay the entire debt load to fall on its own merits, as, again I said, this is about the velocity of money, and not about the problem of the insufficient quantity of money as contained in Lachance’s explanation of the debt-money system being broken. Having re-read it all yet again, I will probably abandon this disussion by repeating myself. If there is only $20 in the money-supply, then there is only $20 in the money supply. I don’t care how long you take to pay it back, there is only $20 available with which to pay it back. The two suitcases of the Zeitgeist Addendum. Monetary velocity can change that $20 of real money into copious quantities of rolled-over ‘debts’, or non-money money, each of which can cancel the other out, but none of which can increase the supply of money to repay the interest. And my discussion has to do with the interest owed on all the debt-money created as the money-supply(Q). The fact that prices can be changed, that wages can be increased or that interest rates can vary between various transactions has NOTHING to do with the money-supply question. The fact that you are not capable of acknowledging the difference between these two distinct operations of the financial economy is perplexing, but that’s what it is. Neither do I understand why a full-reserve advocate, as am I, ignores this essential reality that could sound the death knell to the immoral fractional reserve money-creation system. So, I close and wish you good luck in your pursuit of full-reserve banking, knowing you have a supporter in joebhed. joebhed: Being commonly committed to full-reserve banking, I thank you for your support. If there is only $20 in the money-supply, then there is only $20 in the money supply. I don’t care how long you take to pay it back, there is only $20 available with which to pay it back…none of which can increase the supply of money to repay the interest. But that’s my point: one does not pay-back the entire money supply. Some debt – i.e., some money – is expected to remain owing at all times. Therefore, some of the debt (some portion of $X) is used to make each payment of interest. There is never a need simultaneously to come up with both (a) all outstanding principal (i.e., to repay the entire money supply), plus (b) interest on the principal. Therefore, it is irrelevant that $X < $X+$interest. Just a newbie here, so most humbly I ask if the disagreement between you and Mr. Bhed is about whether that debt created money is in fact extinguished when the debt is paid off, or is converted into debt free money by the banker paying it back into the system, in which case the statement of yours that I quote above is not true. Darn if chasing these dollars around the economy isn’t like trying to keep track of individual trout at the the hatchery! BTW, I am diving into the Ronnie Phillips stuff and trying to understand full reserve. Here’s how it squares: If all debts were paid off: no money. If all debts were not paid off: money. There is no disagreement about the fate of repaid dollars of principal: when a dollar of debt is repaid, it ceases to exist. However, in practice, banks are issuing debts to some while others repay their debts. The flaw in the “$X cannot be used to repay $X+interest” is that X is always taken to equal the entire money supply, rather than a portion of it. Therefore, when X=the-entire-money-supply, the argument that “$X cannot repay $X+interest” is exactly the same as the argument “If you eliminate all money, there will be nothing left with which to satisfy outstanding debts”. In the example I gave in 2001 (reproduced in the article above), I dealt with that issue by treated repaid principal as though it had been replaced with other dollars of debt, dollar-for-dollar (or, the functional equivalent, within the context of the example: debt-free money). Thus the final paragraph in my post, above. There’s a great article by Phillips concerning “The Chicago Plan”. It is definitely a worthy read, particularly at this point in time. It is available, for free, at the Levy Institute website (it is a “working paper”). Have a look at http://www.aynrandlexicon.com. Many people recommend reading “The Fountainhead” and/or “Atlas Shrugged” before reading Rand’s non-fiction. However, in my experience, folks who do that struggle with non-essentials and self-inflicted red-herrings. In my view, the shortest read that gives one the most insightful first-blast of Ayn Rand’s philosophy is her essay “The Objectivist Ethics”, which is the first chapter of her book “The Virtue of Selfishness”. I’d start there. I want to make you aware of the two German economists – Heinsohn and Steiger – who suggest a very logical theory of money, credit and markets all based on the notion of property. I believe you are leaving out the crucial fact that all credit is based on property for two reasons: 1) the person who creates credit-money will need property to turn the money into an accepted currency (otherwise no one will accept the money). 2) the borrower of credit-money must have some property as a mortgage. The value of the first one will determine the value of the money. Only a rich person can thus become a banker in the first place (an his wealth must be in stable property such as land). Under these conditions repayment of principal + interest is on the one hand possible by issuing an additional credit. But an additional credit can only issued if additional property (that has stable value, not bread etc.) is existent. The credit can thus not be used solely for the purposes of consumption as your example suggests but has to be used as an investment, that is for the creation of new stable property (find new gold). But once new Property is found, it can be used for the creation of new property to repay the total debt. On the other hand, if the borrower is not able to create enough new property to create new credit he will have to transfer at least part of the mortgage to the lender. He will thus loose property but still fulfill the credit contract. The money system thus incites the whole society indeed to always expand it’s total wealth, to grow, to invest. But this need not mean enslavement as long as there is no strong concentration of wealth. A concentration of wealth means that an oligopoly in the credit market will exist (only a few people or institutions will serve most borrowers with credits). This would lead to exaggerated interest rates which would lead to further concentration etc. It can – I believe – be argued that this is the situation we are in today, and it can also be argued that there is a natural tendency that such an oligopoly is created if nothing is done to prevent it. But at this point I am unsure what follows as a matter of practical politics from this. A critical discussion would be welcome. Just read through the thread. Very interesting. I have one question though. In the first example given with the $20 dollars created by the banker, he receives principle+ interest payments. Now, doesn’t the principle portion of the repayment cancel some of the debt, ie destroy the money? The banker is only left with the interest with which to buy goods and services. He can’t use any part of the principal to buy goods and services unless he loans it to himself, thereby creating new money. You also showed in the example how inflation kicks in. I don’t think kthat your model can actually prove anything. But if I’d agree with your claim, I’d come to the very opposite conclusion of yours. However, he derives no further reasonings from his discovery. 1) That you have a discrepancy between nominal and real interest rates. Actually, in your model, you’ve robbed “B” (which, I suppose, stands for “banker” als well as for “baker”) of 20,20 USD: 20 which he somehow started out with, and 0,20 of his 2,- nominal profit (interest). Normally, he should end up having 22,- USD, but all he is left with is 1,80 USD. So inflation has really taken a toll on him. While M has been the profiteer. 2) However, of greater importance in the context of what you’re trying to prove (namely that one can redeem a 20,- USD debt PLUS INTEREST with a money supply of only that very sane 20,- principal), are the meanings of “inflation” for a real economy: Processing an equal amount of transactions within the same time period requires a higher money supply as the price level rises. It doesn’t show up in your model, but whenever economic agents raise the prices, with everything else remaining equal, you do actually need more money. Like I said: I’m not inferring any conclusions from this fact other than that your model does NOT hold what it promises. You do NOT need extra money in an economic system to pay back a credit with interest.